You would never know this now, but when I was a little girl, I was an extremely picky eater. I come from a long line of picky eaters; my mother hated pickles so much she told me I was allergic to them! My younger brother ate only chicken strips and strawberry yogurt for most of his life. I also had my issues – I only ate things made by my mom (and maybe McDonald’s Happy Meals) because she was a fabulous cook who knew exactly what I liked. So how do you avoid this kind of trauma and yet get your kids to eat more variety? First, don’t sweat it! We all improve as we get older. (Even my brother did. I have caught him eating sushi!) Let kids know that is eating is communal and FUN! Eat together as a family with no electronics and no distractions. If you are like our family, that is almost impossible most nights of the week so do it on the weekends, or have breakfast together. Let your kids know that what you really want is for them to TRY new things and that may mean only one bite, or even just a lick for the pickiest of eaters. Tell them you are proud not because they like a variety of foods, but because they are willing to try lots of foods. Reward the process, not the goal. You can also make food more fun. For example, rename things they may not like. We renamed salmon “pink pizza” when my oldest was 2 and she ate it up to our total surprise. Quickly thereafter sweet potatoes became “sugar potatoes”, asparagus became “princess green beans” (because of the crowns on top), and broccoli naturally became “baby trees”. You can also give foods special super powers, like milk keeping your bones from breaking. Have them demonstrate when they jump off of something and don’t break a bone. Long foods can make you grow taller, and at our house, fruit can make your eyes sparkle (thanks to Ms. Carrie for that one). Remember you are playing the long game here. 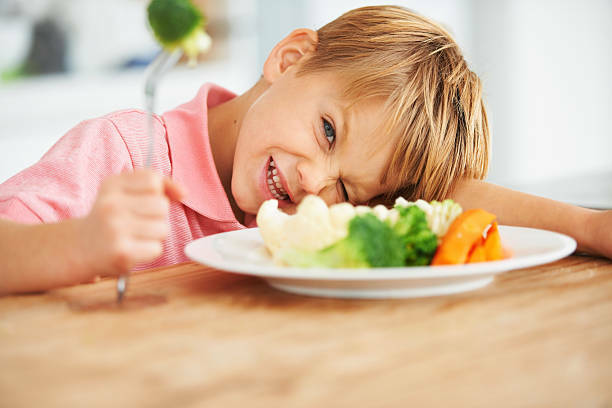 If they hate vegetables at age 2 but eat them when they’re 7, you’re a winner! Try to be patient and remember that trying to like new foods is like learning to ride a bike. You just have to keep doing it, and eventually it will work. If all else fails, try reverse psychology. Save some special foods that only adults can have. They will hover around you like flies trying to get just one taste if they think it is off limits. The bottom line is, don’t sweat the small stuff. Have fun and your kids will too!